I found Susan on Twitter, and I am so grateful I did! 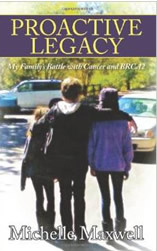 I was a first time author trying to tell my story of dealing with both the loss of my mom to breast cancer and being BRCA2+ and the prophylactic measures I took to avoid the same fate and set a good example for my daughters in case they test positive as well. Susan was able to take my writing and edit it in such a way that someone might actually want to read it—minus my grammar errors and run on sentences. She is a true find and a valuable asset to any author. I made sure to thank her profusely on my acknowledgements page since she helped make my Mom’s dream of me becoming a writer a reality. Thank you for everything, Susan, including the encouragement when I was struggling emotionally. She is a true find—not only as an editor but as a friend.